The aim of the NHS Cervical Screening Programme (NHS CSP) is to reduce the incidence of cervical cancer. Regular cervical screening is offered to women so that pre-malignant cells can be identified and treated which otherwise might develop into invasive cancer. Cervical samples are taken in GP surgeries and community clinics and sent to the cytology laboratory for screening. The laboratory ensures that all processes meet the quality standards as described in the NHS CSP documentation. The laboratory is committed to maintaining a high quality and timely service as described in the service level agreement with NHS Devon. For more information please visit the NHS Cervical Screening Programme Website by clicking HERE. 65+ Only screen those who have had a previous abnormal test or not had three negative tests. Women should only be screened opportunistically if they have previously been invited and have failed to attend for their screening appointment. Women should not be screened outside nationally defined call/recall intervals and these samples will be rejected. For information on private smears please contact the cytopathology laboratory on 01392 402991. 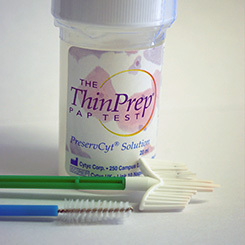 For instructions on how to take a Thin-Prep (TP) liquid based cytology sample, please click HERE. Note 1 : Do NOT refrigerate Thin-Prep vials. Vials should be stored at room temperature (15-30°C). Note 2 : Samples rejected as out of interval will be retained in the laboratory for 7 days. Cervical cytology request forms should be printed directly from the Open Exeter system (please print A5 version only). Cytology request forms are available from RD&E Pathology Stores (01392 402906). For Call and Recall enquiries please contact LEEDS Call and Recall Service (Primary Care Support England); e-mail pcse.screening-leeds@nhs.net or telephone on 0333 014 2884. All request forms and specimen containers must have at least THREE patient identifiers, such as full name, date of birth, hospital number and NHS number. Please see the guidance documentation for the acceptance of cervical screening samples. In order to meet the cancer review standards 2011 and for Women to receive their results in 14 days, the laboratory process must be as efficient as possible and delays should be avoided in any part of the laboratory or reporting process. There are over 100 subtypes of Human Papillomavirus (HPV), most of which do not cause significant disease in humans. Some subtypes (notably types 16 and 18) have been confirmed as agents causing cervical cancer and these are known as high-risk HPV (HR-HPV) types. The Cytopathology department uses the Roche Cobas® 4800 system for all HPV testing. For more information on HPV testing offered by the department please follow the link HERE. Please note: Nurses in training please use NIT for sample taker code. alison.knight5@nhs.net or telephone 01392 402992.